It's been hard for me to keep up with everything that's been going on lately. So much is happening... music videos, day jobs, mini-tours, 7SR projects, PSA jobs, lease arrangements... not to mention, we do sorta have personal lives... (kinda). The song "Spinning Plates" by Radiohead has been frequently playing in my subconscious as I imagine a caricature of myself frantically running around on a stage attempting to keep 25 plates balanced on their broomsticks. I don't think it's a unique feeling. Everyone goes through it sometimes. On the way home from work today my car nearly caught fire. I got a new exhaust system installed last week. Everything seemed to be working out just fine... but then today my flex pipe started sizzling and sending an awful burning-rubber smell through the heating vents. Yum! I had to pull over once, but I made it home without any major consequences. I'm not sure what the problem is... but I'll figure it out. Luckily, the van seems to be in much better shape. It's a good thing too because on Thursday we're leaving to play a few shows in Michigan. The first one will be with Julio Gomez and Michael Riley at Mulligan's in Grand Rapids. 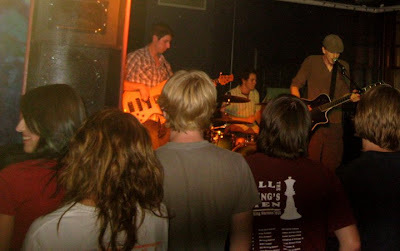 The next show will be with the Wildfire at Basement 414 in Lansing. And the final show on Saturday will be an extended acoustic set at Liberty Street Brewing Company in Plymouth (which is near Detroit). I know I keep promising pictures and audio from Dina's camp with Victor Wooten. They're coming soon... she just needs some time to sort through them all. Tonight's the night! Facing Winter with Nathan Kalish and the Wildfire, Molehill, and Jackson Bailey at the Bottom Lounge! For tickets follow this link or show up before 9pm for a $2 discount. The show is 17+ and we go on at 9pm sharp. It's near the corner of Lake and Ashland right downtown. Click here for the address and a map. This will be our only show in Illinois this month... hope you can make it! Oh yeah, and I forgot to mention... we've got at least 20 brand new t-shirts for sale! 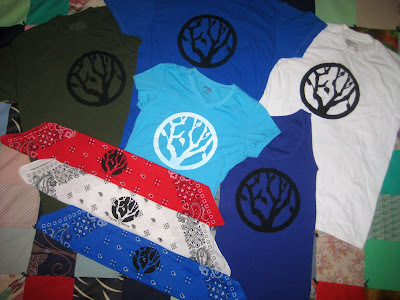 We also silk-screened some bandannas (which are pretty awesome!). We'll have them at our merch booth at Bottom Lounge tonight. Next up we'll be doing a mini-tour of Michigan April 28th until May 1st. Dina has returned from Wooten Woods (a camp run by Victor Wooten). She was supposed to be back last Sunday, but her flight got delayed a few days due to the problems Southwest Airlines was having last week. She hasn't had time to sort through all of the photos and audio yet... but once she does I'll make sure to post some highlights. Hope to see you all at the show tonight!